Samajwadi Party General Secretary Anuradha Chaudhry averted a major tragedy when she was pulled back by the pilot of her helicopter for standing too close to its moving blades. The incident happened last evening when Chaudhry, who accompanied SP state chief Akhilesh Yadav, was waving to supporters. In another incident, Peace Party president Mohmmad Ayub refused to travel in a helicopter which had developed a technical fault yesterday and instead chose to go by road to Modinagar. Anuradha Choudhary recently joins SP just ahead of UP Polls 2012. The western region, bordering Uttarakhand, Haryana and Delhi, has remained the weakest link for the SP, while Anuradha Choudhary who recently joined the party, ending her 16-year-long association with Ajit Singh could bring some smile for SP in Jat dominating western UP. In her recent interview she said “Well, I am not against anybody. I do not specifically name any person. 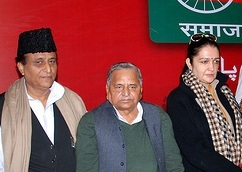 I am with Mulayam Singh, so I am campaigning for the party,” said Anuradha. When asked if she will be able to bring Jats to the SP fold, Anuradha replied: “It is not the question of a community. Only results will tell that how effective I had been in the elections. There is a voice for change and SP has appeared as an alternative,” she said.